Our intensive anatomy course programs combine related modules that can be taken in just 2 or 3 days, for example over a weekend. You will focus on a number of specific anatomical elements and then bring it all together as an integrated repertoire for that area. Enrol in the intensive programs and take advantage of the discounted course fee. Participants are still able to select individual modules and just undertake their preferred one or two topics. The individual anatomy course modules of the Lower Limb Intensives each provide in-depth focus on the key lower limb areas such as the feet, knee and pelvis (psoas, sacrum, hip, femur). Each workshop will look at the bone, muscle, ligaments and tendons of the various body parts of the lower limbs and their function in correct movement. We then examine how the anatomy works and how it can be assisted with repertoire. Common pathologies seen in a studio setting are examined and exercise strategies are discussed and explained. The Repertoire of the Lower Limbs is a bringing together of the entire repertoire as covered for the knee, pelvis and feet and applying it to the lower limbs as a whole. These workshops are designed to provide students with a deeper understanding of sensory responses, primitive reflexes and postural responses that are commonly seen in a studio setting. How these responses can be utilised to improve cueing and movement is explored to improve movement and motor planning for clients at the integration and conditioning stages. Topics include Cueing for Integration, Push & Pull and the Pelvis. The pelvis workshops (psoas and sacrum) are part of this series as the topics are highly relevant to appropriate teaching and cueing. An improved understanding of the psoas and sacrum and how they affect movement and operate with traditional repertoire is essential for improved teaching and cueing. The individual modules of the Upper Limb Intensives each provide in-depth focus on the key upper limb areas such as the shoulders, arms, elbows, hands, neck, jaw, back and torso. Each workshop looks at the bones, muscles, ligaments and tendons of the various body parts of the upper limbs and their function in correct movement. We then examine how the anatomy works and how it can be assisted with repertoire. Common pathologies seen in a studio setting are examined and exercise strategies are discussed and explained. Repertoire of the Upper Limbs is a bringing together of the entire repertoire as covered for the shoulders, elbows, hands, neck and jaw and applying it to the upper limbs as a whole. The Anatomy DimensionsTM series of tutorials is aimed at improving anatomical and pathological understanding for body movement professionals. These anatomy courses are ideal for teachers of all levels of experience in disciplines such as pilates, Gyrotonic and yoga, as well as for personal trainers, massage and musculoskeletal therapists. The tutorials are designed to help develop application and critical analysis of movement towards specific problems that would appear in a studio setting. 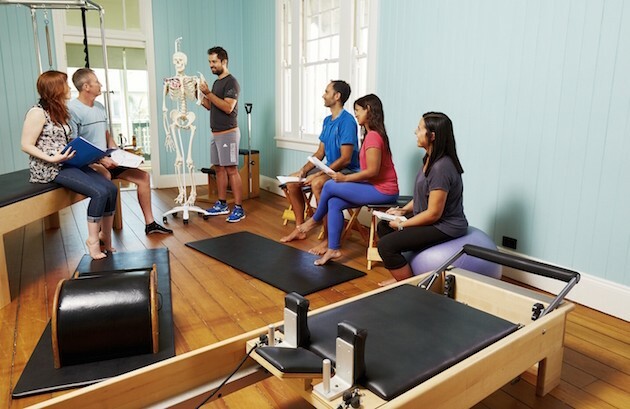 This program was developed in conjunction with physiotherapists, osteopaths, exercise physiologists, occupational therapists, podiatrists, nutritionists, naturopaths and Level 4 pilates and Gyrotonic instructors. The breadth and depth of their professional input means these courses are amongst the most relevant and comprehensive that you’ll find. These professional development courses typically run for around 4-hours with each lecture/tutorial being presented in two parts: Part A will focus on Anatomy, Experiencing the Anatomy and how it applies functionally in the common repertoire; Part B focuses on Common Pathologies and Treatment Protocols for common exercises and movement patterns used in pilates, yoga and Gyrotonic. Upon registration students receive comprehensive workbooks and repertoire manuals. The Anatomy DimensionsTM modules meet the requirements for CEC and PDP accruals for both the Australian Pilates Method Association (APMA) and the Pilates Alliance of Australasia (PAA). Modules also meet the CPD requirements for Exercise & Sports Science Australia (ESSA). Learn valuable skills and build your points at the same time! Anatomy DimensionsTM courses are available in cities and towns around Australia. You don’t always have to travel to the major cities to undertake a worthwhile course such as this! If you’d like to bring this program to town and host a course at your studio, then just contact us. Simply review the upcoming locations and courses then choose which one suits you best. You can secure your place now at our online shop where you can quickly and easily complete and submit your booking form and payment. Secure your place and take advantage of our early bird course fees by booking and paying at least one month before the course is scheduled. Simply register your interest in upcoming courses and we’ll keep you up to date as new programs are announced.